Boston Globe journalists with diverse backgrounds shared thoughts on some of the stories they’ve covered. We crave the news and want to know what’s happening in the world but it’s not every day that we get the opportunity to hear the voices and meet the journalists behind the stories. This event was a night of entertainment, inspiration and advice from some of the best storytellers in town. 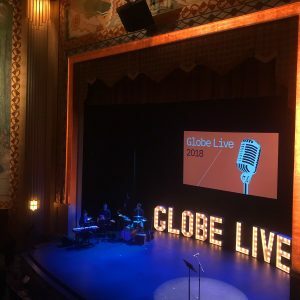 Each journalist who stepped on the stage had a different story to tell and used articles they wrote which were not published in The Globe to sell their points. The first speaker on stage was Felice Belman, The Globe’s deputy managing editor for news and features. She shared how she’d encountered a gunman at a place she previously worked at in New Hampshire. The most inspiring part of her story was about how she was able to remain calm and composed despite the circumstances. As an aspiring journalist, the idea of remaining calm in a crisis seemed to a very important part of reporting. Stan Grossfield’s is an associate editor at The Globe and a writer and a photographer for the sports section, he mentioned some of the exciting moments covering The Red Sox games. He also talked about his near-death experiences while documenting the effects of war on the people of Lebanon through his photographs. He said some of the people who didn’t really want to be photographed such as an angry Red Sox player. Despite having a few bad encounters and people who didn’t want to be in the spotlight, it was apparent how rewarding the profession has been for him. Some people are just really itching to be heard. Alex Kingsbury, who has spent three years as the deputy editor of the Ideas section of The Globe, told a story of encountering a young man in Iraq who had photographs of the war. After Kingsbury questioned the young man about seeing his photographs, the man told Kingsbury, “I have been waiting for someone to ask me that.” Kingsbury felt this was a profound moment. The ‘Globe Live’ was an inspiring event for aspiring journalists, those who are unsure if it’s the right profession for them and those who have been in the field for a while.